Nov 17, 2017 is World Prematurity Day. The authors publication on diagnostic accuracy in neonatal assessment was released today in Pediatrics. On World Prematurity Day, findings from a new study will be published in the journal Pediatrics.1 This systematic review examines the accuracy of different newborn assessments to determine gestational age and identify preterm babies. Preterm babies are more likely to die in infancy or become ill with conditions that could be effectively treated if identified early, such as breathing problems, infections, or low body temperature. The early identification of preterm babies enables health workers to offer these babies special care, including better monitoring and the timely delivery of potentially life-saving interventions, such as continuous positive airway pressure or kangaroo mother care. Furthermore, accurate determination of gestational age is needed to identify growth-restricted infants, who also carry increased risk of mortality and morbidity in infancy and beyond. In order to save lives of premature and growth-restricted infants in LMICs, these high-risk infants need to be accurately identified as early as possible and targeted for interventions. In 2009, BWH faculty in the Division of Global Health Equity began a journey with colleagues in Rwanda, at Partners In Health and at HMS, to strengthen community health across the globe. 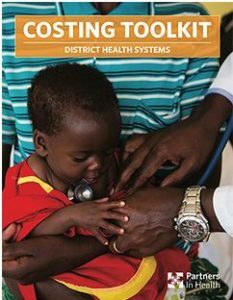 That journey culminated this fall, with the publication of dynamic toolkits on MESH-QI and District Costing Methodology that will allow the impact of this work to endure. Funded by the Doris Duke Charitable Foundation’s Africa Health Initiative, this ambitious work is coming to a successful conclusion and culminating with numerous publications, notably including two powerful toolkits that will allow this work to be replicated at many sites for years to come. Dr . Lisa Hirschhorn and Dr. Peter Drobac were principal investigators on the Population Health Implementation Training project, which sought to make significant improvements to WHO health system building blocks. The project also worked to fulfill MOH priorities such as improving the quality of health center-based care, strengthening monitoring and evaluation, and enhancing community health worker networks. Out of this grant and the vision of these leaders, Partners In Health has developed a model for mentoring health care workers. 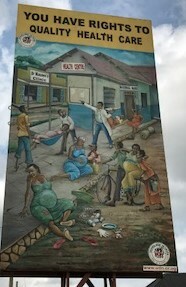 The model is gaining broad attention after improving quality of care in Rwanda and elsewhere for several years. The team also has developed a new guideline—along with a separate, cost-analysis toolkit—that describes how health centers and systems can implement the model, combat the global shortage of quality health care staffing and plan budgets across a range of services. “Building a culture of high-quality care delivery processes and systems is almost impossible, especially in resource-limited settings,” said Anatole Manzi, director of clinical practice and quality improvement for PIH, who worked closely with Drs. Hirschhorn and Drobac on this project. 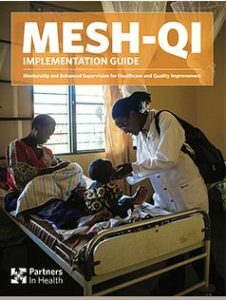 “This guide provides invaluable help to organizations and governments preparing to implement MESH-QI as a model for Health Systems Strengthening,” Anatole Manzi, director of clinical practice and quality improvement for PIH. Dr. Naima Joseph is a Global Women’s Health Fellow at BWH. Through her research and clinical practice around issues of cervical screening, Dr. Joseph is contributing towards improving cancer related morbidity worldwide and improving healthcare for women. Brittany Stopa is a Clinical Research Regulatory Coordinator in the BWH Department of Neurosurgery, and she holds a Masters of Public Health in Global Health. 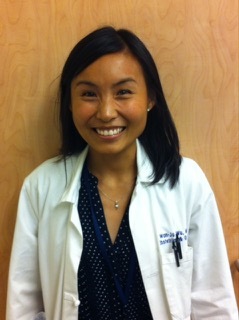 She is a contributor to the BWH Global Health Hub. The BWH Global Health Delivery Partnership Grand Rounds, offered monthly, are open to all staff and clinicians at BWH. I attended the September 2017 Grand Rounds where Dr. Salmaan Keshavjee captivated an audience of global health and health equity supporters with his talk about the Zero TB Initiative. In addition to his appointment as Associate Professor in the BWH Division of Global Health Equity, Dr. Keshavjee serves as Director of Harvard Medical School Center for Global Health Delivery-Dubai and Associate Professor in the Department of Global Health and Social Medicine, at Harvard Medical School. Dr. Keshavjee had our attention immediately when he declared that there are 10.4 million new cases of tuberculosis (TB) each year, but only 6.1 million of them are diagnosed and treated. Further, 1.8 million of those cases result in death each year, making TB the biggest infectious killer of adults globally. That’s a staggering 4,000 people each day that die from TB, a disease that has been treatable since 1947. Through the Global Women’s Health/Family Planning Fellowship I have had the opportunity to work with Possible, a nonprofit organization in Nepal, on community-based interventions to improve uptake of postpartum contraception. With my colleague, Sheela Maru, who also completed the Fellowship I have recently focused on critical issues of access to family planning and safe abortion care. In 2009 the Supreme Court of Nepal found that reproductive rights are considered to be an inseparable part of women’s human rights and within that, the right to abortion is seen to hold an important place. (Lakshmi Dhikta v. Nepal, Supreme Court of Nepal). Prior to 2002, Nepal had very restrictive abortion laws that prosecuted and imprisoned women and their family members for undergoing pregnancy terminations. Now 15 years after legalization, Nepal is an important case study on successful early implementation of safe abortion services, but persistent challenges exist in issues of access, equity, and quality. Alister Martin, a second year resident in the Harvard Affiliated Emergency Medicine program, traveled to Columbia with a Partners Center of Expertise Global Health grant. 3) taking full immersion Spanish classes. How would he fit that into four short weeks? The Partners Centers of Expertise for residents and fellows offer enrichment opportunities in the areas of Global and Humanitarian Health, Quality and Safety, Medical Education, and Health Policy and Management. Established in 2009, the Center of Expertise in Global and Humanitarian Health offers travel grants and monthly faculty-led dinner sessions focused on global health topics and career development. On November 12, 2016 the Center of Expertise in Global and Humanitarian Health hosted its inaugural Global Health Symposium. Read more about Samahel’s work and collaboration with BWH in Pharmacy Today. Although I have visited the Hôpital Universitaire Mirebalais (HUM) in Haiti before, my latest trip there marked the first time I received a behind-the-scenes look at its pharmacy. The impact that access to prescription drugs has on the lives of the hospital’s patients cannot be understated and it is made possible by the significant effort put into organizing medications and treatments, which is key to the pharmacy’s efficiency. Inventory management and supply chain are highly specialized operations distinct from the biochemical side of pharmacy work. I was in the Mirebalais pharmacy in my role as fellowship director for the Walton Global Health Administration Fellowship, which was established in 2014 in BWH’s Division of Global Health Equity. Several generous BWH donors envisioned a program that would build on the existing bonds between BWH, Partners In Health (PIH) and PIH’s Haiti-based organization Zanmi LaSante (ZL). Through the fellowship, ZL administration and leadership would build skills to match the needs of a new 300-bed teaching hospital that was built in the aftermath of the devastating 2010 earthquake. To date, six fellows have participated in the program; among them is Samahel Joseph, director of Pharmacies at HUM. Traumatized by years of civil war and a devastating act of genocide in the early 1990s, Rwanda used to be a place where hope was in short supply.